3096 VAR BURUNDI (1964) Impala*. 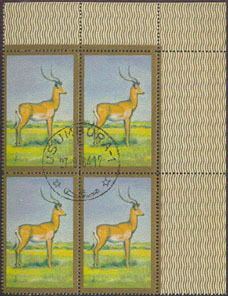 Corner block of 4 (canceled) missing value. Scott No 73, Yvert No 80. 3097 VAR BURUNDI (1964) Impala*. Variety with color black missing, thus lacking value and name of country. Scott No 73, Yvert No 80.